Liverpool’s historic Dock Road is set to undergo a facelift as radical upgrades begin this week. Route closures are in place which are set to last for up to four weeks on Waterloo and Regent Road. Traffic will be unable to pass through the area during this time as a key section will be completed. The closures will begin from 9:30am between Paisley and Blackstone Street to allow drainage repairs, carriageway resurfacing and utility works. During this time, any traffic flowing to and from Liverpool city centre will be directed towards Great Howard Street. 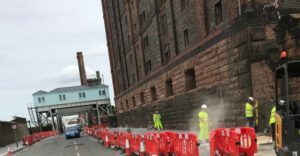 Once repairs and other works are finished, the key section of the road will be completed and the scheme will be set to enter the final six months of its 18-month programme, with the next integral phase seeing works begin on the north of Bramley Moore Dock in late Spring. “To ensure traffic flows this scheme can only be carried out by a phased approach which means some weeks there are full road closures and some weeks just lane closures. We really appreciate the patience of motorists as these essential works are carried out. “Fortunately, there are other alternative routes and with this key stretch of the Dock Road complete after this phase we can all begin to see the finishing line and a vastly improved journey in and out of North Liverpool. The overall renovation of the roads is a key element of Liverpool City Council’s £500m Better Roads programme.